Steve Hess has been working to make people stronger and faster since he was 18 years old, riding his bicycle from house to house with dumbbells in a backpack. 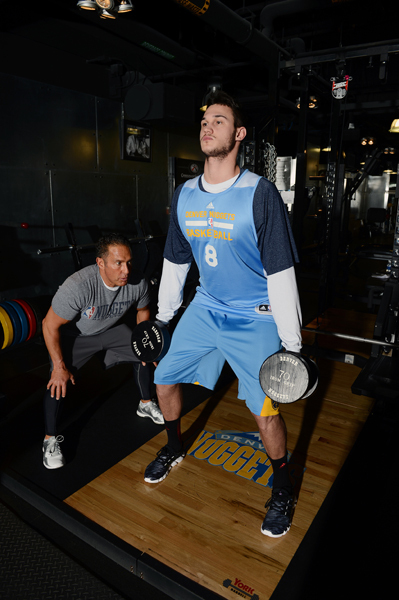 The South African native decided then that he wanted to be a trainer and now he’s been the Denver Nuggets’ head strength and conditioning coach for 12 years. So Hess, has teamed up with Men’s Fitness and the NBA for NBA FIT Team to do the same for you with this total-body functional workout founded in the basic components of basketball: running, jumping, and changing direction. NBA FIT is the NBA’s comprehensive health and wellness program that encourages physical activity and healthy living through being active, eating healthy, and playing together. Steve says: Do at least 10 minutes of active preparation done with co-contractions. Increase weight to match the repetition scheme making sure form is always perfect. 20 minutes on the Cybex Arc Trainer, 4 minutes at a rated perceived exertion (RPE) of 6 out of 10, 1 minute RPE of 8 or 9. Do a total of 4 rotations. From the floor, twist med ball to one side, then throw against the wall. Repeat. Steve says: Participate in these drills at 100% effort except the 6’s in which you should pace yourself so that you don’t go anaerobic too soon. For example, if you’re trying to hit 36 seconds, we’re looking to do an up and back in 12 seconds. If we’re looking to do 33-second 6’s, we’re looking to do an up and back in 11 seconds. 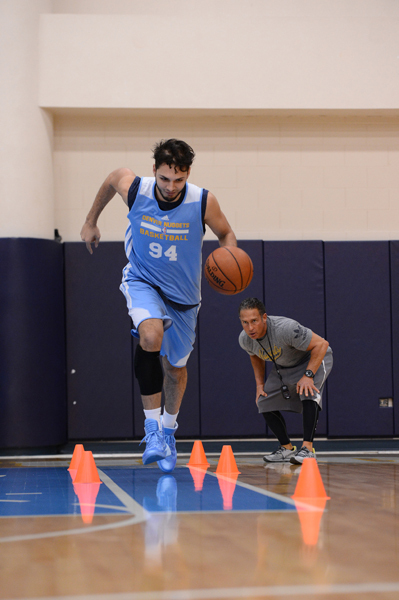 All speed and agility drills should be completed on a basketball court. Steve says: Each 6 should be completed in 33 seconds for guards, and 36 seconds for bigs with a 66-second rest for guards and a 72-second rest for bigs. Run the length of the court three times. Each direction counts as one. Duration: Complete 6 times, 3 times in each direction. Steve says: Cones will be placed for correct stride out on the first three steps. Steve says: Fully extend through hips, knees, and ankles. Increase weight to match repetition scheme making sure form is always perfect. 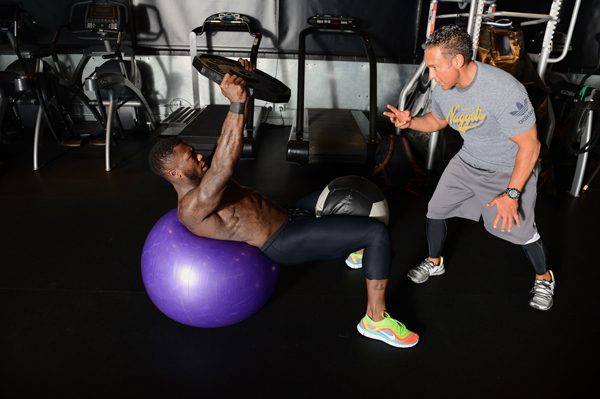 12, 10, 8 3 Normal 30 seconds between exercises, 60 seconds between sets Place a medicine ball between legs. Hold plate overhead. Cross-Core 180 Plank with Twist 12, 10, 8 3 Normal 30 seconds between exercises, 60 seconds between set Pull up toward the machine, twist left then right and back down. Dumbbell Row Roll 12, 10, 8 3 Normal 30 seconds between exercises, 60 seconds between sets Start in an athletic position. After each rep, roll dumbbell on the floor to the alternate hand for the next rep.
Kettlebell Row Split Squat 12, 10, 8 3 Fast 30 seconds between exercises, 60 seconds between sets Use 2 kettlebells. Pull with left hand then jump. Pull with right hand then jump. Alternate. WARNING: Go at a speed that you feel safe. Make sure to get up high on the treadmill and stay comfortable. Perform with maximum effort. Use 12-inch plyo box. Front Stability with Leg Raise on Bosu Ball 30 secs each leg 3 Normal 30 seconds between exercises, 60 seconds between sets Start in a half-pushup position, raise left leg then right. 30 seconds each. 30 seconds between exercises, 60 seconds between set Twist left and press from twist position. Twist right and then press. Cross-Core 180 Pushup 12, 12, 12 3 Normal 30 seconds between exercises, 60 seconds between sets From down position, rotate right then left then up. 12, 10, 8 3 Normal 30 seconds between exercises, 60 seconds between sets Start on knees with band around hips. Drive through hips into press. 3 Fast 30 seconds between exercises, 60 seconds between sets Start in an athletic position, leaning forward onto your toes. Alternate feet by tapping toes on the floor.